The Hungarian Kingdom has lost its northern historic territories and its Slovakian, German, Jewish and of course Hungarian citizens in 1920. The relations between the new Czechoslovakia and Hungary had never been very good. The borders have divided communities for 87 years and made bad economic barriers in the regional economy until both countries entered the Schengen zone in 2007. Some communities are unhappy with this change. The accession of Slovakia and Hungary to the European Union have eased much of this pain in 2004. Commercial relations resumed between the two successors of the historic country, personal relations became less pressed by the borders. And eventually the borders fell on 21 December 2007 as both countries entered the Schengen Zone.The effect of the fall of the borders is even more positive than I had personally expected. I think within a few month these effects will be more clear, so this is not time for assessment yet. However, I hear (and try to collect) similar stories from all over Central-Europe: going against the odds in history, some municipalities try to preverse the disappearing barriers. Although the decision lift the borders and border-crossing points was made at a European level, the municipality of Slovenské Nove Mesto decided to stop people with traffic signs and traffic barriers before the historic day. Slovensé Nové Mesto (Kisújhely) is the minor part of the former Sátoraljaújhely, a town that was devided in the Versaille Peace Treaty. On the night of the Schengen accession unknown people have removed the traffic ban. 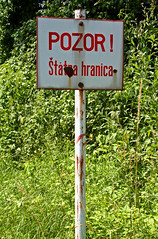 This was replaced by the Slovakian authorities the following day and the road was made unaccessible with flower bowls. The two kilometer detour will hardly stop historic trends. (Hungarian language articles with photos: origó, Népszabadság). The Slovakian prime minister was quoted to remind people that Slovakia and Hungary still has borders and these are separate states. This is true, indeed, the point is that these borders have lost much of their significance. Illustration: Piginka. Originally posted here. If you read or hear similar stories in your country please let us know! Update: A similar story between Austria and Hungary. They tried to seal the border with flower bowls?! At least it’s a lot less forboding than the Wall, if somewhat comical. I passed through there several times, usually at Checkpoint Charlie when I was a teenager, the feeling of fear going through that frontier will never leave me. But shopping in West Berlin was a hell of a lot better than shopping in Prague in 88/89 when I lived there, so needs must! I think it’s such a positive move forward to incorperate Central Europe into the Borderless Zone. What great strides have been taken since 1989/91. Obvisiously it’s not been everyone’s view here in Western Europe, which annoys me since most people here seemed to have forgotten that they wanted to see all of Europe free and were elated when The Wall fell. I hope the day comes that the other European nations can enjoy the benefits that many of us here take for granted.